Every Tuesday get double the punches for any 6oz. purchase or more on your FREE Fanatic Card. It pays to be a fanatic!! 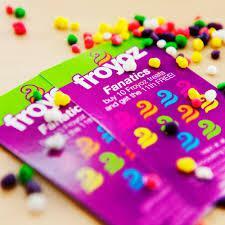 Froyoz Garden City has 12 different flavors of premium frozen yogurt. We wanted to build a place where you could enjoy a delicious dessert made of the finest ingredients. Froyoz understands that great yogurt is the foundation for a special dessert. Froyoz is committed to delivering fresh and nutritious toppings along with the opportunity for each customer to create a dessert masterpiece. We value good health as a way of life and believe that the pleasure of dessert should be guilt free. As we continue the tradition of simple and satisfying desserts made from the best ingredients, our hope is that Froyoz will always exceed your expectations. We also now offer Ice Cream and Sorbet. So their is a frozen treat for any pallet.